Greek tortoises are commonly kept as pets, and their affable personalities make them enjoyable companions. Since they are so long-lived, however, prospective owners should think long and hard about whether they want to commit to caring for an animal that could easily outlive its owner. 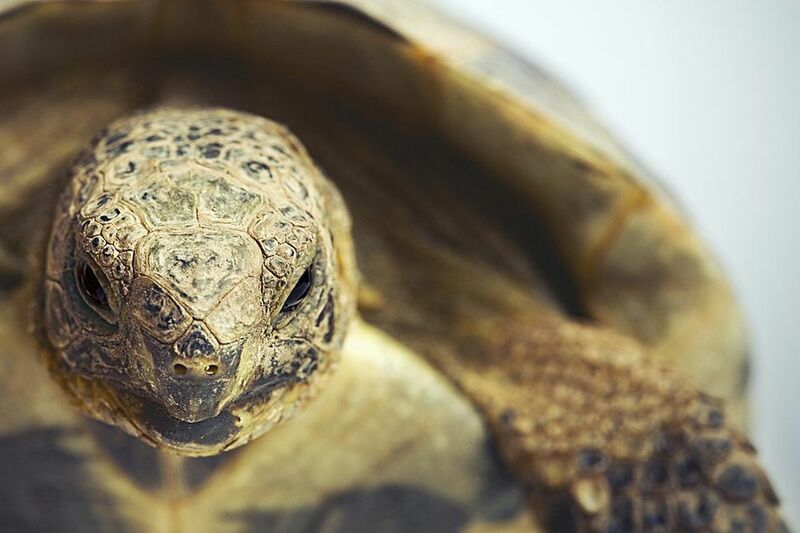 Like any other pet tortoises, Greek tortoises have some specific care requirements, which if followed correctly, will keep them in good health. Greek tortoises, like many reptiles, prefer not to be handled by humans. Larger tortoise varieties may even bite if picked up. Handling is very stressful for tortoises, and it can have a negative impact on their health. For the most part, Greek tortoises are amiable and mellow creatures if their needs are met and their aversion to handling is respected. Greek tortoises stay fairly small but still need ample space to exercise. Many tortoise owners prefer using large plastic storage tubs instead of fish tanks since tortoises don't need the height the tanks offer, only the floor space. They use clamp lights to provide the heat and make lids using roll window screening from home supply stores and wood frames. These are fairly inexpensive ways to offer large enclosures that are still easy to clean. Traditional, large fish tanks are also acceptable and are a turn-key option for new tortoise owners who don't want to get creative making their own custom enclosure and don't mind spending a little more money. In warm months, your tortoise should be allowed some observed outside time. It is crucial you never leave your tortoise when it is outside. They are faster than one would think when running away, are very good at hiding, and can even be scooped up by raccoons, hawks and other wildlife. If you build an outdoor enclosure it should have a screened top and be dig-proof, since tortoises can burrow under simple barriers. Also, never put your tortoise outside in a glass tank. The glass and sunlight create oven-line conditions that can burn a tortoise. Reptile bedding such as reptile safe mulch, wood shavings, and other dirt mixtures are good for Greek tortoises. Just make sure the food they eat is offered on a plate or other surface so they aren't accidentally ingesting their bedding. A water bowl should be large enough and accessible for your tortoise to walk into and drink or defecate when needed. It also helps add humidity to the enclosure. Tortoises are herbivores. Years ago tortoise owners would feed their pets canned cat and dog food to make them grow faster. But it has since been discovered that a diet high in protein is harmful to tortoises; a diet low in protein and high in fiber is much healthier than food meant for carnivores. A variety of dark, leafy greens such as collard greens, endive, fresh parsley, and dandelion greens should be the majority of your tortoise's diet. Timothy hay that is chopped up should be added to keep your tortoise's beak trimmed and for the additional fiber. Small amounts of fruits such as chopped raspberries, strawberries, or apples may be added but should not make up more than 10 percent of the diet. Some tortoise owners offer a small amount of gut-loaded crickets and mealworms, but it is not necessary. Regular dusting with calcium powder on the veggies is recommended to make sure your tortoise is getting enough calcium as well. Pet tortoises need two kinds of lighting - UVB lighting and lighting that emits heat. Under tank heaters don't do a good job at providing ambient heat, only keeping the bottom of the tank warm, therefore, heat lights are preferred, especially for the large enclosures that tortoises require. UVB lighting is needed for your tortoise to maintain strong bones and metabolize calcium. Without UVB lighting your tortoise may develop a metabolic bone disease. Heat lights must be provided to maintain a basking area at about 95 degrees and allow the rest of the enclosure to stay above 75 degrees. The basking area can drop in temperature at night. Shell rot is commonly found in Greek tortoises, as it is with many other tortoises and turtles. Usually the result of a fungal infection, shell rot can cause painful shell deformities that are life-threatening to the animal if left untreated. And like other reptiles, Greek tortoises are susceptible to metabolic bone disease. This ailment results from an imbalance in its calcium-to-phosphorous ratio and leads to overall weakening of its bones. It's another painful condition that can be fatal if not treated properly. Greek tortoises are also prone to another common illness among reptiles: respiratory infections. These are typically found in tortoises, turtles, and lizards kept in enclosures with the wrong humidity settings. A Greek tortoise with a respiratory infection will wheeze and appear lethargic. As with many reptiles, your best bet for getting a Greek tortoise will be a captive-bred variety from a reputable breeder who knows its medical history. You're potentially committing to this pet for a very long time and if it has serious health problems, it may become costly. In general, a healthy tortoise has clear eyes, free of mucus, and a smooth shell without any signs of deformity or decay. If at all possible, ask the tortoise's breeder if you can watch it eat. The only tortoise who refuses food is one that is ill.
For more profiles on various breeds of tortoise, check out our other tortoise profiles.